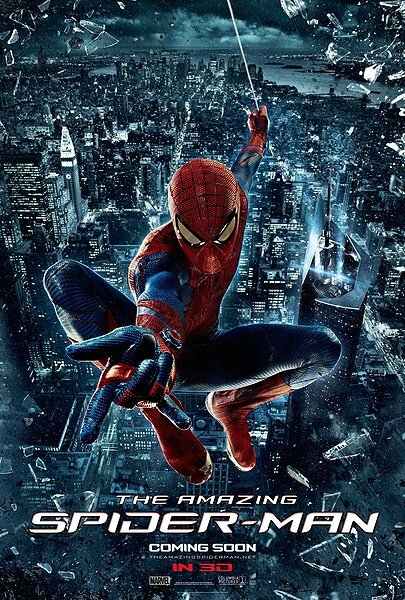 It has a few flaws, but for a first installment of the rebooted Spiderman franchise it is better than any of the original films, especially Spiderman 3! The characters especially where far better this time around with Andrew showing Toby how to play Peter Parker. I will be looking forward to the next films in this great new Spiderman reboot. But I would love to see flaws I found fixed, they are so small though that a sequel would be able to see and fix them. The Amazing Spider-Man is the story of Peter Parker (Garfield), an outcast high schooler who was abandoned by his parents as a boy, leaving him to be raised by his Uncle Ben (Sheen) and Aunt May (Field). Like most teenagers, Peter is trying to figure out who he is and how he got to be the person he is today. As Peter discovers a mysterious briefcase that belonged to his father, he begins a quest to understand his parents’ disappearance – leading him directly to Oscorp and the lab of Dr. Curt Connors (Ifans), his father’s former partner. As Spider-Man is set on a collision course with Connors’ alter-ego, The Lizard, Peter will make life-altering choices to use his powers and shape his destiny to become a hero. The best advice I can give to anyone going to see this film would be don’t watch any trailers, reviews or opinions of anyone else but you after seeing it (I get the irony of telling people not to read reviews whilst on my review, but you can read the rest of my review after you see it). Just as always I will not be giving away any spoilers so you don’t have to worry about reading this review before seeing the film, although you may wish wait until you have seen the film. To start off let’s talk about the acting. The acting was very passionate which was a little surprising as it’s a super hero film, but you could really feel the emotional responses from its main characters (Andrew Garfield, Emma Stone) when various emotional scenes play out, beyond that would be a spoiler. Now for the main character who’s name I forget, nah only joking its Peter Parker (Andrew Garfield) who I must say is the best interpretation of New York’s friendly neighbourhood Spiderman I have seen in a film. But as his competition is a cheap 80s film and Toby Maguire it was an easy win. The best part about Garfield was that he looked and sounded the part, nerdy kid from Brooklyn. He was a teenager who had enormous power and treated it like a toy as you would. But my main compliment to this Peter Parker was that he made jokes even during battle’s which was always missing from the last Spiderman. Sadly the thing many of us worried about was it feeling too soon for a reboot and it was lingering about. Mainly I would say in the origin of his powers but I don’t see how it could be avoided, at least with this film they tried to explain a very clever excuse for the radioactive spider what with using spider silk to create super strong cable. Think I have talked enough about people and their silly human emotions. Now let’s talk about something more fun like the visuals. 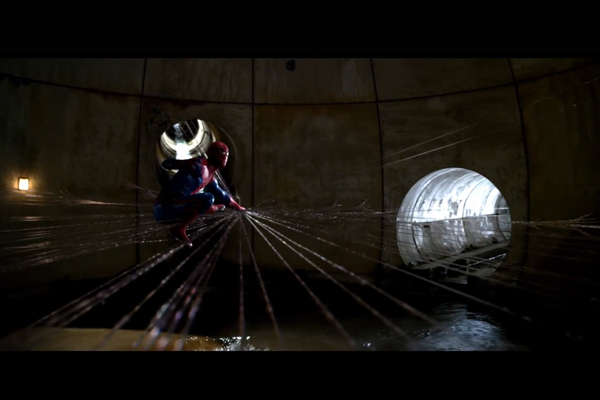 The special effects, physical props and visual landscape shots where excellent viewing as expected of a web slinger film. There’s nothing quite like being taken around New York through the eyes of Spiderman. The lizard looked good and I am one those people who commented on him not having a snout but thinking about it now am not sure how they would get him to talk using a snout without it looking absolutely stupid, but at times the lizard looked more creepy than scary (Picture above for example). The best thing I felt about this films look was the way that the set of action scenes and spidey web slinging took place at night which was what Spiderman should be doing since he fights crime and it’s easier to keep a secret identity when you are fighting crime at night (don’t ask me how I know that). The best review I found would be “At 28, Garfield’s slightly older than Maguire was when he played Peter Parker in 2002, but his combination of fresh-faced innocence, nervous agitation and wry humour is immediately appealing.” Tom Charity. I like this because it states Andrew’s achievement as Peter Parker and points out the new presence of Parkers humour plus his fresh young look. My favourite scene without giving anything away would be the fight scene in the high school between the lizard and Spiderman, because it shows a great physical fight which plays with the effects and also shows a lot of the Spiderman humour whilst in the fight, which was never used in the original Spiderman. But of course this scene also includes my favourite Stan Lee cameo yet (you’ll see). Ok so I don’t normally do spoilers but I would like to talk a little about spoilerific stuff. What I liked about this films origin of the hero and the villain was that both are very much in development today, for example splicing technology used on the lizard has been in development a lot recent with plants to make super strong and big vegetables. Now I know that Gyen is going to die at some point and as she hasn’t died in this one she must die in The Amazing Spiderman 2, don’t remember how she actually dies in the comics but it should be interesting to see how they portray it (if anybody could remind me how she meets her end that’d be great). Now another good point is we see more spider like creativity with Spiderman this time for example in the pic below he sends out webbing in all directions and senses for vibrations much like a taranchula does to catch its prey, I love clever stuff like that. Couple of theories to throw out there, I didn’t realise this watching but that bully is actually Flash Thompson and I think that the guy in the end of the credits is Mysterio pure theory, although I remember something about him having a connection with Peters father. Finally it’s a small flaw but it grinds my gears, why didn’t Uncle Ben state the legendary life lesson for Peter “With Great Power Comes Great Responsibility” to be fair there was some variation of those words but I don’t see why they couldn’t just do the damn line! But finally it’s a good film with strong characters. Great review. You expanded on a lot of what I said in mine. If they did take Gwen out in the next one – wow. You talk about emotional impact. I’m already smitten with Emma Stone (yes a grown man said smitten) and to see her character go down. I think I might go after the villain myself. I also forgot about the Stan Lee cameo. One of my favorite parts. As for sequels I have a new theory, I think that Mary Jane will be introduced in the next one and that will cause a conflict between Gwen and Peter, but she lives and the villain will be somebody who can save Norman, then in the third we will see green goblin who will kill Gwen at the end. Was there something at the very end of the credits? I was all alone after everyone left so I didn’t stay. Maybe I should You Tube it. I don’t know if I would say this was better than the first two films in the original trilogy. However, I thought Garfield was a much more authentic Spidey with regards to how he is portrayed in the comic. I will also take Emma Stone over Snaggletooth any day of the week. Spoiler Gwen gets killed by the Green Goblin but she survives 90 odd issues before that happens so who knows if they will end up killing her off. Probably won’t happen but i would love it if the guy in the shadows was Morbius. I still stick with my view it’s better than the original trilogy. Points to that effect are that I hate Tobey MaGuire as spider-man, it didn’t follow the comics much at all and the third film disgusted me! what you did not like dancing emo spidey? If your kid watching a superhero film and you end up hoping the villain wins, your leading man is bad! dancing emo spidey! seriously what the hell was that! Just tried to watch the clip now, I cant do it I just cant! I liked this film. I think they did a good job. Garfield seemed a little over the top with some James Dean Rebel imitations, though. I think the guy in the shadows wasn’t Osborne or Mysterio. He might have been the Jackal. And with his storylines about cloning, it’s possible that even though Gwen might die in the next film, her clone could keep Emma Stone in the films. I’m also of the mind that Peter’s dad was working on the Venom suit with Eddie Brock’s father, so if Sony is really developing a Venom movie, that would dovetail well. The Jackal point you made is pretty good but I am not sure about the rest, because that would be completely changing the story of venom and fans would not like that at all! I’ll definitely check out your review. Nice review Tim. This movie definitely had plenty of fun and exciting moments and characters that we could feel something for. For some reason though, I just kept on thinking about the Sam Raimi original movies and yes, I know they aren’t masterpieces by any means, but I still loved them and it just seemed like this whole film was unnecessary, but fun. I loved this film! It felt much more like the Spiderman from the comics then Raimi’s ever did. I seem to be one of the only people who think that the guy in the cell at the end was Normon Osborne though?! I do have a concern, though. From the trailers, I think that when Spidey swings all over skyscrapers, it looks super fake, super CGI-y. Does it any better in the actual movie? God i hate those people, even if they just look on their iPhone with brightness up full, how am i not supposed to throw my nacho’s at the idiot! That does appear to be the consensus. Mysterio, huh? interesting. I have my own theories on that, but I have to watch it again! I really liked some of the things you mentioned here. Several clever elements that they tossed into this film that really made it great. While I think Tobey did a great job as Parker, Andrew did a better job as Parker AND Spider-Man. Good point on the use of the LIzard CGI and avoiding the snout. Loved the film, great review man. Oh I think the green goblin pushes her off a building or a bridge am a little phasy on the details, hope that helps. Everyone seems to be saying good things about this. I think you’ve tipped the scales and I’ll venture out to see it when the crowds slim down. Thanks!